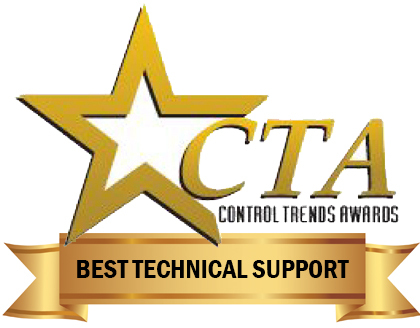 For the third consecutive year, Contemporary Controls is the ControlTrends Awards winner for "Best Technical Support Company of the Year — Small Manufacturer". "The award is valued recognition of the hard work and dedication from our support team, led by Diego Mateo," said George Thomas, President of Contemporary Controls. "Our entire team works hard to support our customers not just in their buying decisions, but in implementation and trouble-shooting in the field. We believe that our customer's success is our success." Thank you so much to all of our supporters who voted for us in this year's ControlTrends Awards. As usual, Eric and Ken hosted a great event. This year's celebration was held at Atlanta's Historic Fox Theatre. We enjoyed the music and the company. It's always fun to kick-off AHR Expo with the CTA Awards and focus on the latest industry innovations and product developments. The ControlTrends Awards were created in June 2012 by Eric Stromquist and Ken Smyers as a way to recognize innovations and achievements in the HVAC, Controls, and Building Automation Industry. Contemporary Controls is grateful for the continued support and effort Ken and Eric have invested in this community-building event.